provides customers with the most affordable and sturdy kitchen and bathroom cabinets. At Madeval, we build our customers reliable closets and cabinets in modern and contemporary styles. No other cabinet maker in the Houston, TX area is as experienced as the team at Madeval is. Madeval is an interior designer based in and serving Houston, TX. We are certified and insured and have been in business for 39 years, providing our customers with high-quality services. 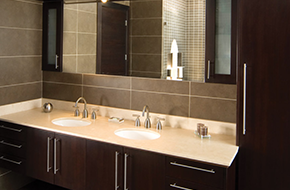 We specialize in modern and contemporary styles of kitchen and bath cabinets and custom cabinetry. Our products are perfect for remodeling and new construction, and fit well in town homes and apartment complexes. With Madeval, your satisfaction is guaranteed. If your home is undergoing a remodel, the bathroom and kitchen areas are good places to focus on. Sometimes you need more space, and with our kitchen and bath cabinets, we can provide you with just that. We use MDF, particle board, veneer wood, and glass to create beautiful storage spaces that will help reduce the clutter in your home and give you more space to organize. 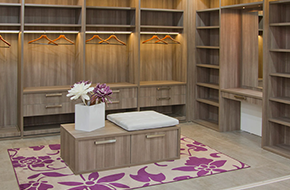 We offer the creation and installation of contemporary closets for all homes in the Houston, TX area. We can do cabinets inside closets to give you a unique, personal space to store all of your clothes and belongings. 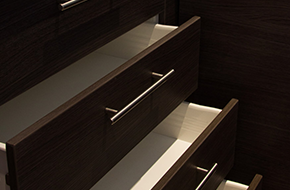 Contemporary closets will give your home a sense of organization and aesthetic appeal that it did not have before. Lastly, we offer custom cabinets. Custom cabinets allow you to create your own look. If there is a certain style that you want that you cannot find in store, Madeval will create it for you. At Madeval, we provide “modular cabinet design.” For service in Houston, TX, call today for free consultations, free 3D renders, and 10% off for first time clients.